And I’m just trying to survive. It can turn your heart black you can trust. Springsteen’s words have me praying for our nation today: Lord, have mercy. Lord, have mercy. Lord, have mercy. It gets me thinking about the concept of Kingdom (which is what Jesus would say we are supposed to be about)… or I suppose we could say influence instead. This is not as meaningful of a term for us Christians, but for those who aren’t, I suppose it does come down to influence. So I’ll use “kingdom” interchangeably with “influence.” So I ask myself, and I would love to ask those I talk to, but to avoid unnecessary offense, I refrain. What kind of kingdom are we trying to create? Pet Finder – Useful and Cruel! It seems everyone wants a pet but no one wants to be bothered keeping track of them, so GPS and other pet tracking devices have become quite popular lately. The Pet Finder however uses a far simpler approach, but I can’t imagine there are too many pet owners willing to use it. A relatively small, waterproof tag is attached to your pet’s collar and when activated by an included remote, will sound an 85db audible beep you can use to locate the animal. For comparison, a gas lawnmower or shop tools are rated at about 90db, so I’m pretty sure having an 85db beeping tag hanging around your neck isn’t that pleasant. Particularly when you consider a dog’s hearing is far more sensitive than our own. 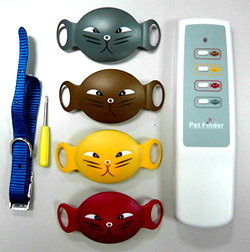 You can find the Pet Finder at GadgetsUK for about $40 and it includes 4 separate color coded tags and a special tool for attaching them to a collar. Red Politics, Blue Politics… what about purple? … we need a better understanding of the role of faith in public life. Political appeals – even if rooted in religious convictions – must be argued on moral grounds, rather than as sectarian religious demands, so that the people (citizens), whether religious or not, may have the capacity to hear and respond. Religion must be disciplined by democracy and contribute to a better and more moral public discourse. Religious convictions must therefore be translated into moral arguments, which must win the political debate if they are to be implemented. Religious people don’t get to win just because they are religious (in a nation that is often claimed to be a Judeo-Christian country). They, like any other citizens, have to convince their fellow citizens that what they propose is best for the common good—for all of us and not just for the religious. Clearly, part of the work to be done includes teaching religious people how to make their appeals in moral language, and secular people not to fear such appeals will lead to theocracy.